The Uncurated Life: Shu Uemura: The Beauty and Makeup Competition 2009 "Mother Nature"
Shu Uemura: The Beauty and Makeup Competition 2009 "Mother Nature"
Mr. Shu Uemura made history by introducing the first make-up competition has gone beyond the contest of make-up techniques - it inspires, motivates, and excites all participants with unlimited possibilities of creativity with make-up. 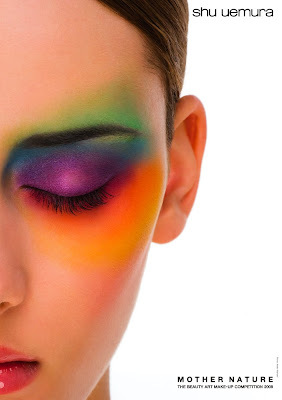 Since 2004, Shu Uenura has been offering the compettion as a place of expressing the revolutionary concept in make-up design as artistic expression. This year, 2009, Philippines joins the whole world raise the brand's spirit by promoting the talent of local make-up artists in beauty artistry. As the brand's affinity with the world of creativity and art becomes stronger, we continue to cultivte creativity of each make-up artist, collaborating different forms of art into one. From the earth on which we stand, the life-0gicving and nurturing features of nature surrounds us all by embodying various forms of beautiful creations in the universe. 2009 make-up competition focuses on the Earth which we live, in to celebrate its preciousness and energy which brings us life. may have graduated (or currently enrolled) from a professional make-up course but have a little experience. have frequent exposire in being a make-up artists. NOTE: should not have current affiliations with other make-up brands. 2. Attach the form with the indicated items below (place in an envelope). At least 5 items used for the beauty artwork should be shu uemura products. 3. Submit entries to any of the following addresses, adress to Ms. Lyra Importante, Shu Uemura Product Manager. Submit entries on or before JULY 8, 2009. 4. 20 Entries (10 novice, 10 Professional) will be selected to compete for the top 10 slots (5 novice, 10 professional) thought an actual screening by the Shu Uemura make-up artist team. Screening of entries will be on july 10, 2009. Selected entries will be notified via SMS or contact Shu Uemura botique at +632.8978575. 5. Top 10 entries will compete on September 2009, for the finals. Venue: TBC. opportunity to become part of the Shu Uemura associates team. Don't forget: Deadline for submission of entries is on July 08, 2009.